Western Parotia (Parotia sefilata) is a species of paradise birds that people can watch when traveling to Manokwari. I guided Prof. Richard Ebright - an American biologist on a birding tour to Arfak mountains from 18 to 20 July 2013. In the last day of the tour, we entered a blind that was especially built for watching Western Parotia. The male bird has got black color all over his body with 6 antennas at his head. We had to wait for 5 hours inside the blind that was wet, dark and full of mosquitoes. In order to seduce his partner, male Western Parotia had to perform a beautiful courtship dance where female Western Parotia perched on a small branch of a tree just above the dancing ground. 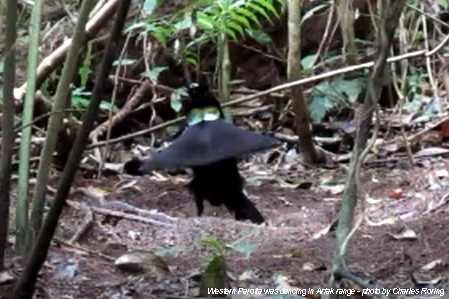 Before dancing, the male bird cleaned the "stage" from fallen twigs and leaves. Then he would dance to impress his lover. The style of the dance was similar to ballet. 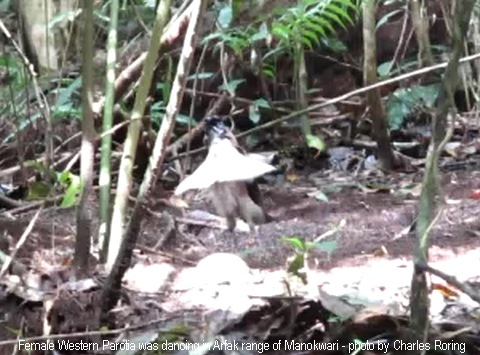 The Young Western Parotia also Danced! When we were waiting for an adult male Western Parotia to land on the ground and performed, suddenly, we saw a young Western Parotia landed on the ground. She performed a courtship dance without the presence of male bird. We were very surprised to see that scene. At first we thought that it was another species but later after opening our field guide book, Birds of New Guinea, we determined that it was a young or a juvenile Western Parotia. During our stay in the blind, we were able to see Spotted Cat Bird and Cinnamon Ground Dove. It was a fleeting moment for the cat bird. Cinnamon Ground Dove was at the dancing site quite long. I think he was there for more than 30 minutes finding grains on the ground. I could make some videos and photographs of this bird. The bird stayed still with her eyes staring at the "peep hole" where I put my camera. I guessed the auto focus lamp of my camera attracted her attention. We also saw two other smaller birds that we could not shoot by my camera. We returned to Manokwari city again at 12.00. During the birdwatching tour we saw vogelkop bower bird, blyth's hornbill, cinnamon ground dove, spotted catbird, magnificent birds of paradise and two smaller birds that I could not identify. They flew away in seconds before I could take pictures of them. As a birdwatching destination, Manokwari has got plenty of places where birdwatchers can explore to see tropical birds. For lowland forest birding, Western Crowned Pigeon, Pinon Imperial Pigeon, Beautiful Fruit Dove, Sulphur Crested Cockatoo, Sandpiper, and Kingfishers are some of the birds that can be seen in Manokwari.